From the author of Mushroom Wisdom comes a provocative new book, Sage Spirit - Salvia Divinorum and the Entheogenic Experience. Salvia divinorum is a unique entheogenic herb that can provide access to profound states of consciousness voyages into hyperdimensional space, and otherworldly journeys into the realm of the sage. In this work, musician, writer and shamanic explorer, Martin Ball, navigates his way through the strange world of sage space, from Burning Man to cosmic serpents and overtone singing, bringing back guidance and advice for the use of Salvia divinorum as a true entheogen and ritual sacrament. 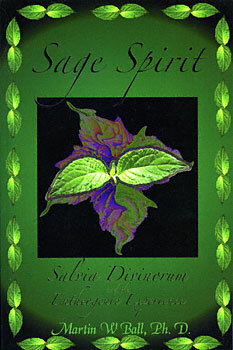 "Sage Spirit should be read by all those who seek to understand the nature of Salvia divinorum, especially as it relates to human consciousness, personal growth, and spiritual development."